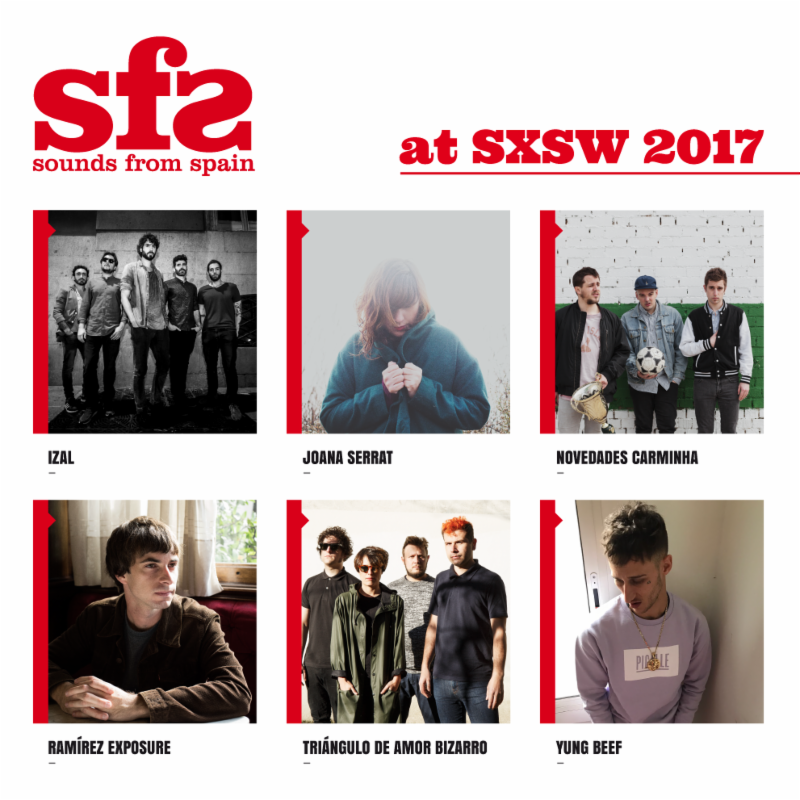 SOUNDS FROM SPAIN will lend its support to six bands from Spain at the upcoming edition of South by South West (SXSW) which will take place during March 2017 in Austin, Texas. The following bands will perform at the 10th edition of SFS at SXSW: IZAL, JOANA SERRAT, NOVEDADES CARMINHA, RAMIREZ EXPOSURE, TRIANGULO DE AMOR BIZARRO and YUNG BEEF. These groups have been previously selected by the festival itself and by the organizations that form part of the supporting platform, over 40 bands auditioned. Sounds From Spain will have two showcases starting March 15 and finalizing on March 16. All six bands will play at the concerts organized by SOUNDS FROM SPAIN at SXSW. This is the tenth consecutive year in which SOUNDS FROM SPAIN sponsors Spanish music at SXSW. Hinds, Macaco, Dorian, Nacho Vegas, Supersubmarina, Lori Meyers, are some of the groups that have previously played in SXSW. More than 15,000 music professionals will be present, including record labels, managers and industry press who will have the opportunity to attend almost 2,000 concerts. Sounds From Spain will have an official pavilion for the Spanish companies attending the festival giving them the opportunity to meet with the most prominent international producers and record labels. There will also be 12 prominent companies from the music industry in Spain at the SOUNDS FROM SPAIN Pavilion at SXSW 2017, from artist representatives to record labels: ALTAFONTE, ARTICA BOOKING AGENCY, ATAQUE RECORDS, BOA MUSICA, DELFUEGO BOOKING, ESMERARTE, HOOK MANAGEMENT, LA VENDICION RECORDS, LUUP RECORDS, OVALSOUND, PRIMAVERA SOUND y RAMIREZ EXPOSURE. SOUNDS FROM SPAIN is the supporting platform for the internalization of the music industry in Spain which is a division of ICEX Spain Exports and Investments, the National Institute of Theater Arts & Music (INAEM), the SGAE Foundation, the Society of Performing Artists (AIE), the Technical Performance Representatives (A.R.T.E), the Music Producers of Spain (PROMUSICAE) and the Independent Radio Union (UFI). The objective of SOUNDS FROM SPAIN is to promote Spanish music exports, encouraging the presence of professionals from the music industry in the most important international conferences such as SXSW (Austin), Musikmesse (Frankfurt) LAMC (New York), and Womex.